This simple grilled halibut is deliciously light and easy to prepare. 1. Mark tomatoes with an “x” at the bottom and blanch for 1 minute in boiling water. Shock tomatoes in ice water, then peel off skins (saving them). Seed tomatoes (saving the seeds, too) and finely diced the tomato. 2. Stir vinegar and garlic with half of diced tomato and saved skins and seeds. Let sit for 30 minutes then strain through a cheesecloth without squeezing (to keep liquid clear). 3. Dispose of tomatoes (or cook into your next pasta dish). Whisk red onion into vinegar and slowly drizzle in oil. Stir in remaining diced tomato and season to taste. Whisk before using. 1. Preheat grill on medium high and heat a fish grill (mesh). Brush halibut fillets with oil and season lightly. 2. Place thyme on grill and once it starts smoking, place halibut fillets on grill. Close lid on BBQ and let cook for 8 minutes. 3. Lift lid and turn halibut 90 degrees and close lid. Cook fish 8 minutes more, until it flakes easily when touched with a fork. 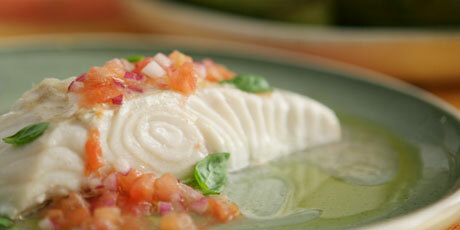 Remove halibut and serve with tomato vinaigrette. Tear basil leaves over immediately before serving.